A modern take on the perfect day. Brianne and John met through mutual friends, which then led to being friends on social media. The modern day flirting began, liking and commenting on photos! Their first date was off to a rocky start, Brianne wasn't much for dating, because she was content focusing on her daughter. It took a lot of persuading but Brianne finally said okay, let’s grab dinner. John even asked if he could pick her up and buy flowers and stubbornly Brianne said no. She got there early because surprise nerves set in. When a gorgeous man walked up to her with a huge smile and bouquet of flowers, she melted and knew it was love at first sight. They saw each other every night that week. Eventually chilly February came and they spent the day doing a photo shoot for a local whiskey distillery. Brianne was cold and tired and wanted to grab coffee but John had other plans. He drove to where they had their second date, Des Moines Art Center and Rose Garden. It had started to snow, so Brianne was not excited for their walk in the park. John went to open the door for Brianne and got down on one knee to propose. After she said yes she asked, “Do we still have to walk around the rose garden?” He laughed and said no, so they decided to celebrate with dinner instead. Where she found out their daughters had helped him pick out the ring, which is where the planning began! Together, they knew they didn’t want a cookie cutter wedding. Brianne had always dreamed of a perfect Pinterest styled wedding and had never thought of the idea of eloping. They decided to plan their intimate semi-secret wedding in their favorite hiking spot near their house. They even celebrated their first dance in their kitchen! They said they wouldn’t change their personal big day for anything, but wanted to celebrate on their one-year anniversary. 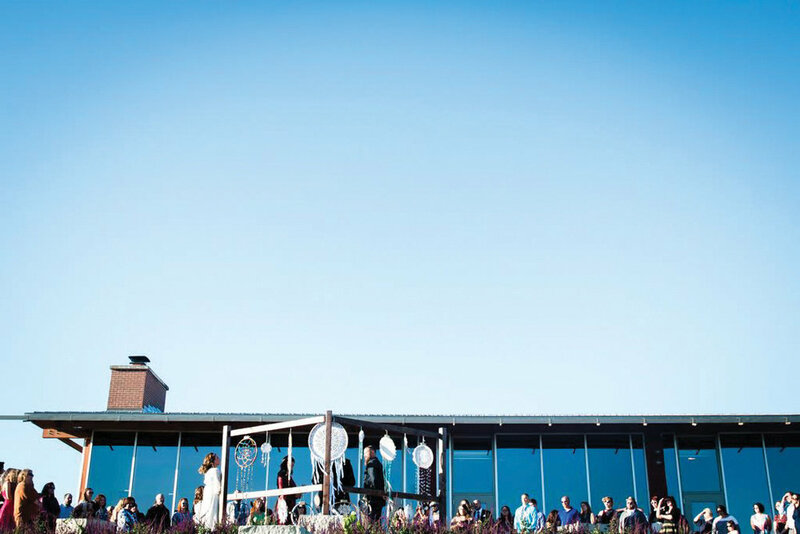 They chose the venue Raccoon River Nature Lodge because they wanted to do a lot of the planning themselves. After the wedding stress began, Brianne said she realized why couples hire wedding coordinators, but she was glad she was able to make it unique to them. Brianne made all the decorations, each and every detail, have a meaningful touch. She hand-made 17 dream catchers because they were married on the 17th. They had pandas hidden in their decorations because that was their nickname for each other. Brianne said it perfectly, when you’re planning your wedding let it reflect the love of you and your husband. The big day is for you! Don’t let family and friends push you to do something you don’t want for your wedding day. They were elated to have their wedding unique to them, to reflect the love they look forward to sharing with each other for the rest of their lives.